Authors’ original spelling has been retained, following standard historical practice. See reasons for spelling variations in “Nineteenth-Century Spelling,” Ensign, Aug. 1975—including uncertain spelling conventions and spelling as an expression of personality. 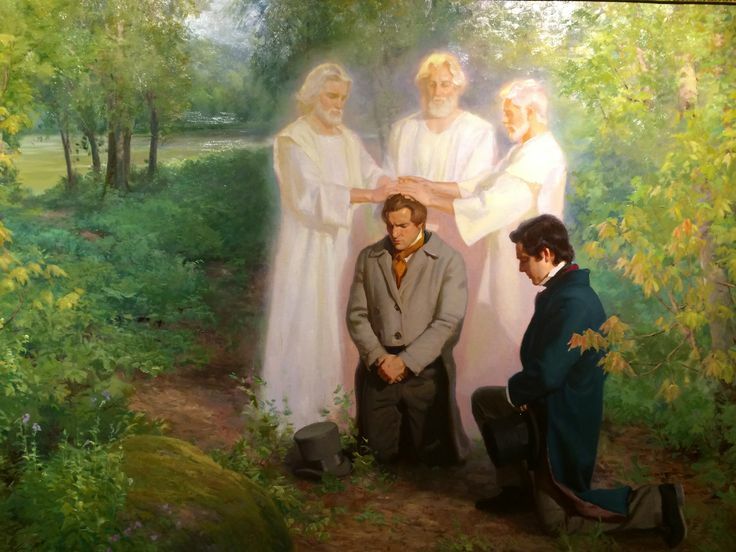 The conferral of the priesthood to Joseph Smith and Oliver Cowdery was a primary requirement for the restoration of the Church. But although we know the exact date the Aaronic Priesthood was restored, time has apparently obscured such specific information about the Melchizedek Priesthood. By examining scriptures and records of the time, however, we can put some pieces of the historical puzzle together to give us what may be a closer approximation of its elusive time sequence and background. 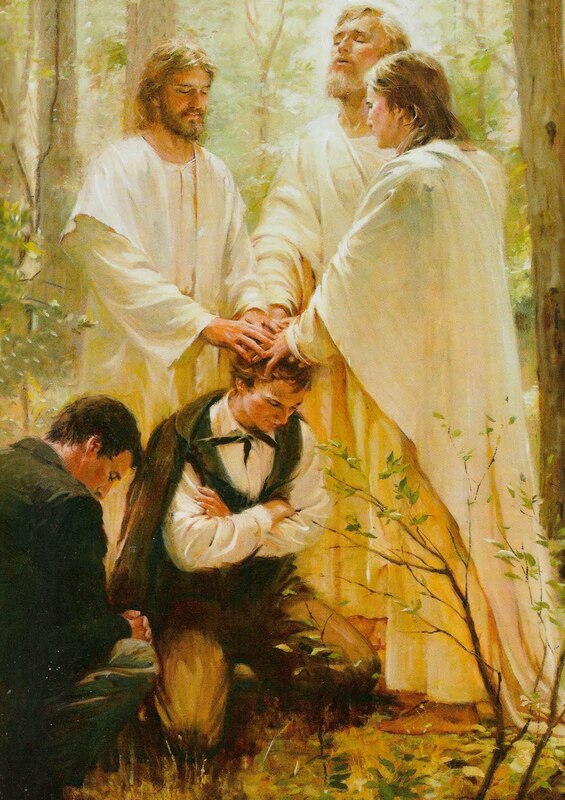 Joseph Smith states that the messenger conferred the Priesthood of Aaron upon them. 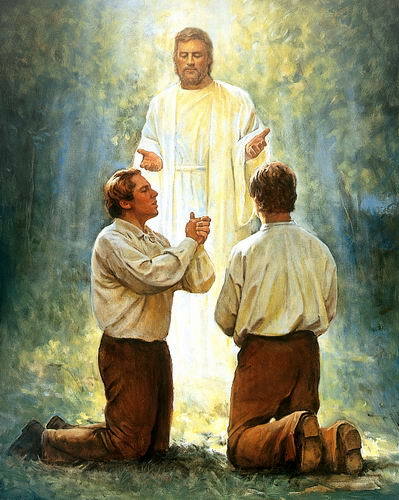 The angelic visitor explained that the priesthood “had not the power of laying on hands for the gift of the Holy Ghost, but that this should be conferred on us hereafter.” (History of the Church, 1:39). After identifying himself as John the Baptist, the messenger further stipulated “that he acted under the direction of Peter, James and John who held the keys of the Priesthood of Melchizedek, which Priesthood he said would in due time be conferred on us” (History of the Church, 1:40). The Doctrine and Covenants attests in several places that the higher priesthood was subsequently restored. In Section 27 (August 1830), the Lord refers to the restoration of the Melchizedek Priesthood as something which had already taken place. He speaks of “Peter, and James, and John, whom I have sent unto you, by whom I have ordained you and confirmed you to be apostles, and especial witnesses of my name, and bear the keys of your ministry and of the same things which I revealed unto them” (D&C 27:12). In Section 20, given four months earlier (April 1830), the Lord refers to Joseph and Oliver’s prior ordinations to the priesthood, speaking of commandments which “were given to Joseph Smith, Jun., who was called of God, and ordained an apostle of Jesus Christ, to be the first elder of this church; and to Oliver Cowdery, who was also called of God, an apostle of Jesus Christ, to be the second elder of this church, and ordained under his hand” (D&C 20:2–3). And how great is his joy in the soul that repenteth! Take upon you the name of Christ, and speak the truth in soberness. And as many as repent and are baptized in my name, which is Jesus Christ, and endure to the end, the same shall be saved. Oliver is apparently quoting from or referring to the existing revelation. If this is a valid assessment, the date of that letter, 14 June 1829, narrows still further the time period in which the restoration could have taken place—between May 15 and June 14—a period of only one month. There is evidence to support still another reduction in the time sequence. Because of a decided increase in opposition to their work of translation and other activities in the area of Harmony, Joseph and Oliver began searching for a safe place to complete the translation of the Book of Mormon. Oliver wrote to his friend, David Whitmer, for assistance. David later stated that in the letter, Oliver told “me to come down into Pennsylvania and bring him and Joseph to my father’s house, giving as a reason therefore that they had received a commandment from God to that effect. I went down to Harmony, and found everything just as they had written me.” 7 According to Joseph Smith’s records, they went to the Whitmer farm “in the beginning of the month of June” (History of the Church, 1:48–49). David Whitmer’s account concurs with the prophet Joseph’s: “The translation at my father’s occupied about one month, that is from June 1 to July 1, 1829.” 8 If David’s report of June 1 can be taken literally, then Joseph and Oliver had already arrived at Fayette by that date. This is a significant clue because Peter, James, and John appeared to Joseph somewhere between Joseph’s homestead in Harmony, Pennsylvania, and Colesville, New York—both of which are considerably south of Fayette. Therefore, the visitation would seem to have taken place before Joseph, Oliver, and David travelled north to Fayette, arriving on June 1. An obvious question at this point is whether or not the priesthood was restored while the group was traveling from Harmony to the Whitmer farm—perhaps by way of their friends at Colesville? David Whitmer, by inference said no to this inquiry. Orson Pratt asked David the direct question: “Can you tell the date of the bestowal of the Apostleship upon Joseph, by Peter, James and John?” David replied: “I do not know, Joseph never told me. I can only tell you what I know, for I will not testify to anything I do not know.” 9 It appears from David’s reply that the event did not take place at a time when David was present nor even in the immediate proximity—so that event seems to have transpired before the three began the journey. David’s journey down to Harmony from Fayette had occupied approximately three days. 10 Assuming that a similar amount of time was expended on the return trip, and that the arrival date at the Whitmer home was indeed June 1, then perhaps at least two, and probably three additional days could be pared off the end of the month of May 1829, in a further reduction of the probable restoration period; therefore, the visitation probably occurred between 15 May and about 29 May 1829. There is yet another question which must be asked: Did Joseph Smith and Oliver Cowdery travel with David to the Whitmer farm only to return to Harmony during the month of June? If they did, perhaps the event transpired during a return visit. “We found the people of Seneca County in general friendly, and disposed to enquire into the truth of these strange matters which now began to be noised abroad. Many opened their houses to us, in order that we might have an opportunity of meeting with our friends for the purpose of instruction and explanation. We met with many from time to time who were willing to hear us, and who desired to find out the truth as it is in Christ Jesus, and apparently willing to obey the Gospel, when once fairly convinced and satisfied in their own minds; and in this same month of June, my brother Hyrum Smith, David Whitmer, and Peter Whitmer, Jun., were baptized in Seneca lake, the two former by myself, the latter by Oliver Cowdery. From this time forth many became believers and some were baptized whilst we continued to instruct and persuade as many as applied for information” (History of the Church, 1:51). I believe that the press of these matters kept the Prophet Joseph and Oliver too busy in Seneca County to return to Harmony during the month of June 1829. Therefore, all the information we now have, taken together, seems to place the date of the restoration of the Melchizedek Priesthood between 15 and about 29 May 1829. The question of where the priesthood was restored is easier to answer than when. While reminiscing on the singular events of this period, the Prophet recorded: “The voice of Peter, James, and John [came] in the wilderness between Harmony, Susquehanna County, and Colesville, Broome County, on the Susquehanna river, declaring themselves as possessing the keys of the kingdom, and of the dispensation of the fulness of time!” (D&C 128:20). I suspect that the visitation occurred while Joseph Smith was still living in Harmony (before moving to the Whitmer farm) during one of his trips to Colesville to visit the Joseph Knight family. While Joseph Smith and Oliver Cowdery were engrossed in the translation of the Book of Mormon at Harmony during April and May 1829, the urgency which they felt for completing their labor (which had already been delayed by the loss of 116 manuscript pages) left little or no time for them to engage in the daily pursuits of the necessities of life. Although the Isaac Hale family was in a position to assist them financially, Joseph Knight, Sr., states: “His wifes father and family ware all against him and would not h[e]lp him.” 11 This difficulty was greatly alleviated through the exceptional generosity of the Knight family, who on more than one occasion supplied them with food and even provided paper for the manuscript. Understandably, Joseph Smith felt a particular affinity for the Knight family, and that feeling was reciprocated. Joseph Knight, Sr., had shown a genuine interest in the work of the Prophet from the outset, having been present at the Smith’s Manchester home on 22 September 1827, when Joseph first obtained the gold plates from the Hill Cumorah. The Prophet made a number of trips along the twenty-eight mile stretch of road from Harmony to the Knight farm, which was situated opposite the village of Nineveh, on the east side of the Susquehanna River, in Colesville Township, Broome County, New York. Probably the occasion for the restoration of the Melchizedek Priesthood stemmed from one such visit undertaken by Joseph and Oliver. “Brother Joseph said that at that very time Peter, James and John came to them and ORDAINED THEM to the APOSTLESHIP. “They had 16 or 17 miles to travel to get back to Mr. Hale’s, his father-in-law, and Oliver did not complain any more of fatigue. “Now, brother Huntington, I have told you what I heard Bro. Joseph tell almost the last time I ever heard him talk. We can accept elements of this account only with reservation. John Reid, mentioned in the story, was involved in Joseph Smith’s June–July 1830 trial—one year later. How well Addison Everett was able to segregate his facts and not merge events of the two summers is uncertain. Since Elder Snow and Brother Everett were contemporaries in the St. George area, we can’t be sure whether this is an experience which Brother Everett had shared with the Apostle or whether they knew it independently. In any instance, it is evident that Elder Snow thought the account was true. I feel that this account approximates the experience of the Prophet which occurred a year later, in 1830 and that it is not part of the restoration of the Melchizedek Priesthood. In July 1830, Joseph and Oliver returned to Colesville to attend to some confirmations when they were confronted by a mob. The two men “considered it wisdom” to flee, records Joseph, “without even waiting for any refreshments” (History of the Church, 1:97). Larry C. Porter, chairman of the Department of Church History and Doctrine at Brigham Young University, is a member of the Church Youth Correlation Review Committee. Reuben Miller Journal. 21 Oct: 1848, Archives of the Church of Jesus Christ of Latter-day Saints, Salt Lake City, Utah. John the Baptist, Peter, James, and John, Moses, Elias, and Elijah are numbered among those instrumental in transmitting particular priesthood keys to the Prophet following the appearance of Moroni in 1823. See History of the Church, 1:39–42; D&C 110:11–16. Messenger and Advocate, Kirtland, Ohio, II, Oct. 1835, p. 199. Messenger and Advocate, Kirtland, Ohio, I, Oct. 1834, p. 15. David Whitmer, An Address to All Believers in Christ, Richmond, Mo. : 1887, p. 32. Letter of Oliver Cowdery to Hyrum Smith, Fayette, New York, 14 June 1829. Statement of David Whitmer to newspaper reporter, see Kansas City Daily Journal, 5 June 1881. Kansas City Daily Journal, 5 June 1881. “Report of Elders Orson Pratt and Joseph F. Smith,” Deseret Evening News, vol. XI, no. 302, 16 Nov. 1878. Ibid. David Whitmer stated that: “Oliver told me that Joseph had informed him when I started from home, where I had stopped the first night, how I read the sign at the tavern, where I stopped the next night, etc., and that I would be there that day before dinner, and this was why they had come out to meet me.” Apparently the trip involved a three-day period. Joseph Knight, Sr., “22 Sept. 1827. Manuscript of the early History of Joseph Smith finding of plates, &c. &c,” Church Archives, p. 5. Addison Everett was baptized 1 Sept. 1837, by Elijah Fordham, and was one of the first members of the New York Branch of the Church. He later lived in Nauvoo, and after the exodus, served as a bishop of a ward in Winter Quarters. Brother Everett was designated as one of the original pioneer company of 1847 with Brigham Young. He thereafter served as a bishop of the Salt Lake City Eighth Ward. Addison died in St. George on 12 Jan. 1885. See Andrew Jenson, Latter-day Saint Biographical Encyclopedia, Salt Lake City: Deseret News Press, 1936, vol. 4, p. 702. Letter of Addison Everett to Oliver B. Huntington, St. George, Utah, 17 Feb. 1881, recorded in “Oliver Boardman Huntington, Journal #14, [under back-date of] 31 Jan. 1881,” Harold B. Lee Library, Brigham Young University. See also O. B. Huntington Diary #15, 18 Feb. 1883, pp. 44–47, where additional particulars are recorded. Letter of Oliver Cowdery to Phineas H. Young, Tiffin, Ohio, 23 Mar. 1846, Church Archives. Statement of Oliver Cowdery to Samuel W. Richards, 13 Jan. 1849, cited in Deseret Evening News, Salt Lake City, 22 Mar. 1884. Samuel W. Richards, “Oliver Cowdery,” Improvement Era, II, Dec. 1898, p. 95. This entry was posted in Apostasy, Church History, Jesus Christ, Priesthood. Bookmark the permalink.